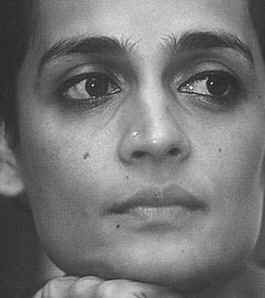 In Walking with the Comrades, novelist and activist Arundhati Roy (The God of Small Things) travels into the forest with India’s Maoist indigenous communities at war with the government. How did you earn the guerrillas’ trust? When the Indian government declared war against the Maoists, Indian liberals, for the most part, took a very safe, neutral position: “The government is bad, the Maoists are bad, the poor people are sandwiched in the middle.” I am no Maoist, but I thought that was a profoundly dishonest position. It elided the fact that the government had secretly sold lands belonging to indigenous tribes to mining and infrastructure companies. This is illegal and unconstitutional, and yet it was being done brazenly. Hundreds of thousands of paramilitary police were closing in on forest villages to clear the land for the corporations. About 600 villages had been emptied; some 300,000 people had fled their homes and had either moved to police camps or were hiding, terrified, in the forest. Many had joined the guerrilla army and were fighting back. The government and the media, campaigning for corporations, labeled them terrorists and called for them to practice Gandhian nonviolence. I wrote that Gandhian nonviolence was political theater that could be effective provided it had a sympathetic and empowered audience; how could people in remote forest villages, far from the gaze of the media or a hostile middle class be Gandhian while they were being raped and murdered? How could the starving go on hunger strike? How could those with no money boycott goods? My writings made their way into the forest, and one day a note was slipped under my door, inviting me to walk with the comrades. What surprised you most about them? You write about India’s poor and disenfranchised, but you do so in English (and with a fairly sophisticated style, to boot)? Who do you write for? Language is such a volatile and political issue in India. We have hundreds of languages and each has its own history of oppression and exclusion. So whatever language you write in, you’re excluding the majority of people in the country. Yes, I write in English, but my writing is immediately translated into Hindi, Bengali, Odiya, Telugu, Tamil, Malayalam. Still, it is a huge irony to be a writer, in any language, in a country where so many are illiterate. Who do I write for? For everybody and nobody. I write when my body cannot accommodate my silence any more. I do what I can to use language and not let it use me. One of the pleasures of reading your writing is your irreverence and exuberance—a tone not commonly found in analyses of this sort. Is this a voice that you’ve had to hone? I don’t spend a moment thinking about my style. But I do spend a fair amount of time structuring the argument and narrative. It takes a few drafts for me to moderate the fury I feel. As for irreverence, I’ve always found so much laughter, so much cutting humor amongst people even in the most deadly moments. When I think back on my time in the forest, more than anything else I remember laughing till tears were streaming down my face. You invite our admiration for how “the poorest people in the world have managed to stop some of the richest corporations in their tracks.” How can readers support these communities?